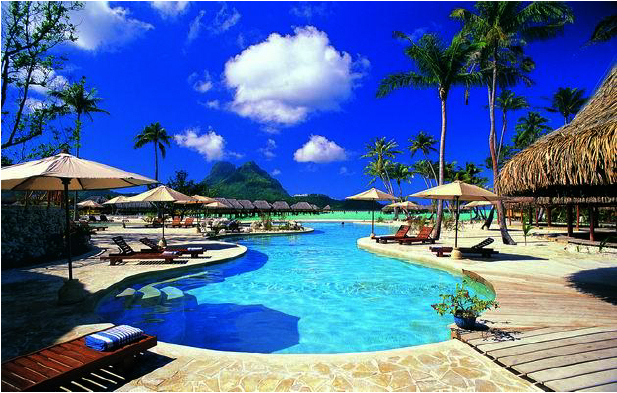 If you truly want to get away from it all, French Polynesia might just be the most perfect destination on the planet. Sunny, remote and quite glamorous, you’ll see why these famous islands surrounding Tahiti beckon you to the trip of a lifetime. If this isn’t paradise, then paradise may not exist after all. Welcome to the land in which James Michener wrote Tales of the South Pacific and was the subject for the native images painted by Gauguin and Matisse that shocked the world. Yes, French Polynesia is a very special land… a mythical place with a mythical people that offers what some might consider a once in a lifetime experience south of the equator. Think of French Polynesia as the Hawaii of the 1950s before statehood – unspoiled, underdeveloped and well, just a little untamed. With exotic island names like Bora Bora, Manihi, Tikehau, Moreea, and many more, each experience can be distinctive and very five star. Guillaume Brault, general manager of the Mahahi Pearl Beach Resort told me “To most, this is the trip of a lifetime. You encounter an authentic experience here. That’s what we offer best. Authenticity.” Maybe that’s why the rich and famous love to escape their red carpet life, if just for a couple of weeks, to return to sense of authenticity in a place like this. The region’s laissez faire attitude topped with a chic French accent creates a unique and spectacular environment for any desire. Want to curl up in the lap of luxury and eat fresh fish with a side of poisson cru ( coconut milk), then enjoy endless spa treatments? This is the place for you. Think you’re up for an athletic vacation where you can snorkel, dive, kayak, surf and do just about any other water sport? This is it. Need some down time away from your Blackberry and spreadsheets to complete that unfinished screenplay, polish off that Great American Novel, or just paint your own watercolor masterpiece? Come here to do it and recharge your creative batteries. Think of it as nature’s Botox. Once you land, relaxation sets in immediately. And getting there is a snap. Hop on a plane to Los Angeles, then the easy part becomes flying directly from Los Angeles to Papeete, the capital of Tahiti, the cornerstone of what is known as French Polynesia. Air Tahiti Nui gets you there in a quick eight hours – just a little more than what it takes to Honolulu, and feeling rested upon arrival in the evening. Since you arrive at night, stay at the Sheraton Hotel Tahiti or Radisson Plaza Resort Tahiti before moving on to one of the luxurious resort islands from there. You’re greeted with a fresh lei of fragrant Tiare (similar to a gardenia), a custom that’s implemented on every island you visit. And paradise beckons you. To know the islands, you first have to be acquainted with its land and peoples. The extensive island chain of French Polynesia is home to only 250,000 inhabitants, 70% of which live on the island of Tahiti. There are about 120 islands and atolls that comprise the area, much more than Hawaii’s eight islands, lending a feeling of remote tranquility when you get there. And it’s hardly Gilligan’s Island, or even the current hit T.V. show, Lost for that matter. You see, the Polynesians are a dynamic and diverse culture. They are a people who seek adventure. They’re survivors avidly concerned with the environment, love to have a good time and make visitors feel welcome. Although the French are not usually known for their overfriendliness, they are known for creating an environment that’s above reproach, which is what they’ve done here since it was a French protectorate in 1842 and then becoming an overseas territory in 1946. Think of it as the ultimate lagoon destination. 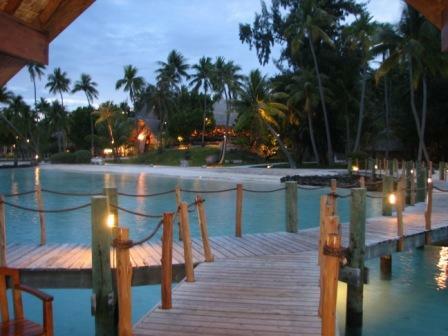 Over water thatched bungalows are the most common accommodations on the islands. From land, as you walk to the middle of the lagoon to your rooms at a Pearl Beach Resort, you’ll see the marine life at your feet. Inside your teak wood suite of plush linens and island artist artwork, you encounter a Tahitian television; a glass floor coffee table where you can see all the fish swimming underneath you. These built-on-stilts suites are the perfect way to end either a sport-filled or relaxing day. Either way, you’re in paradise. Want to go snorkeling? I hopped down the steps of my bungalow and swam over to a coral nursery where I found fish of every color and size. Have the need to catch your own meal? Do like I did and go deep sea fishing to catch a grouper, then have a picnic on a remote motu with a group of both friends and natives. Ready for dessert? There’s a coconut tree over there. It’s the kind I learned to climb to capture fresh coconut, then all you do is shuck it with your teeth or simply crack it open to taste the milky nectar. Anything seems possible in the South Pacific, even for the most ardent city dweller. Part of that specialness are the pearls found dotting both tourists and natives. The pearl farms that cultivate those precious balls of marine perfection are sprinkled among the islands. Elizabeth Schneider, a Tahitian pearl expert revealed, “About one in 10,000 pearls are naturally perfect, so most are cultured like this one I’m holding. Even cultured pearls of high quality take about five years to create. We created one that was a jaw breaker size valued at over $20,000.” So pearls are big business, especially the black ones that are actually shades of charcoal grey. If you are a diver and want to try your luck at obtaining perfect pearls, dive in. It can be done. “Diving is serious business and has an amazing following here,” shares Emmanuel Cebile, general manager at Pearl Resort in Tikehau. For dive enthusiasts at all levels, Pearl is the only luxury hotel chain to marry quality resorts with professionally run PADI dive centers at six of their resorts. “Our guests appreciate the special combination of being able to play at Robinson Crusoe yet enjoy all the creature comforts of luxury resorts,” declares Emily Biotteu, a French transplant and Pearl Resorts representative. She goes on to say, “Dining experiences at our resorts are memorable for their subtle mix of the best of French, International and Polynesian cuisine, often accompanied by exciting Tahitian dance entertainment. As you know.” Yes, I well know. I was that guy they pulled on stage to learn the native Polynesian dance in front of the entire dining audience. Bongo drums and all. But it was worth it, because the cuisine on the islands is unmatched. I danced for my supper. And most of the food is shipped in, since vegetation is rare on the islands due to space and logistics. But the fish is fresh and often comes from very nearby the resorts. Fresh papaya juice and the best hot chocolate outside of Paris is de riguer for breakfast, while a light salad lunch is the perfect energizer in between sports activities. The vegetables, the fruit, and even the beef seemed to taste better on the islands. Want to be pampered? There’s an island secret called monoi, a liquid blend of the essences of hundreds of flowers, oil and indigenous coconuts that’s used in most of the spa treatments. The resorts offer a range of traditional Polynesian and other massage techniques and treatments using the purest natural oils and essences. During treatments you’ll be ensconced by a new line of Manea Spa products are made exclusively for the Pearl resorts in Tahiti. a formula that retains the intrinsic natural properties of flowers and plants. The Bora Bora, Tikehau and Manihi Pearl Beach Resorts (all a Member of Leading Small Hotels of the World) offer treatments, scrubs and massages to soothe both the soul and the senses. And all are travelled between by either boat or a quick plane ride. That’s the island way. 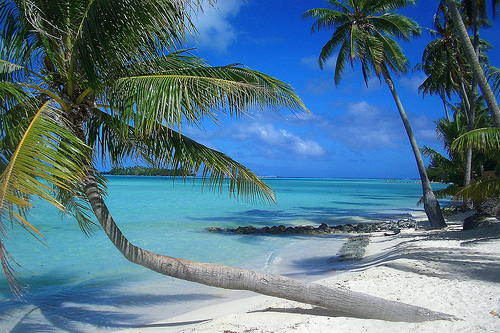 Islander folklore has that the French Polynesians honor dreams here. They feel that dreams are planted and fed, and not tossed away. That dreams and love never die in Tahiti. Upon departure, I am given my last strand of shells, signifying the hope of safe travels and a beckon to return again. The shells and the trip symbolize the trip of a lifetime and I make a silent promise to myself to return again one day. With more sunscreen.